Fifty years ago, Rachel Carson published “Silent Spring,” a lyrical and compelling book about how DDT and other pesticides were damaging the environment and human health. The book called for a change in the way humankind viewed the natural world and became an inspiration for the environmental movement. One of Carson’s staunchest advocates and closest friends was Iowan Shirley Briggs, who met Carson when they worked together at the U.S. Fish and Wildlife Service in the 1940s. 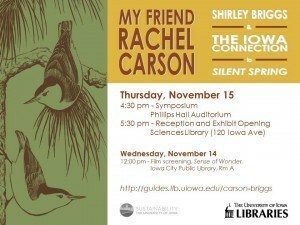 To recognize this Iowa connection to “Silent Spring,” the University of Iowa Libraries and Office of Sustainability are presenting a symposium and exhibition opening on November 15, inspired by the extensive collection of Briggs’ diaries, letters, photos and artwork in the Iowa Women’s Archives. The symposium begins at 4:30 p.m. on Thursday, Nov. 15, in Phillips Hall Auditorium (100 PH), followed by an opening reception in the UI Sciences Library, where an exhibit of Briggs’ photos, writings, art work and memorabilia will be on display through Jan. 7. 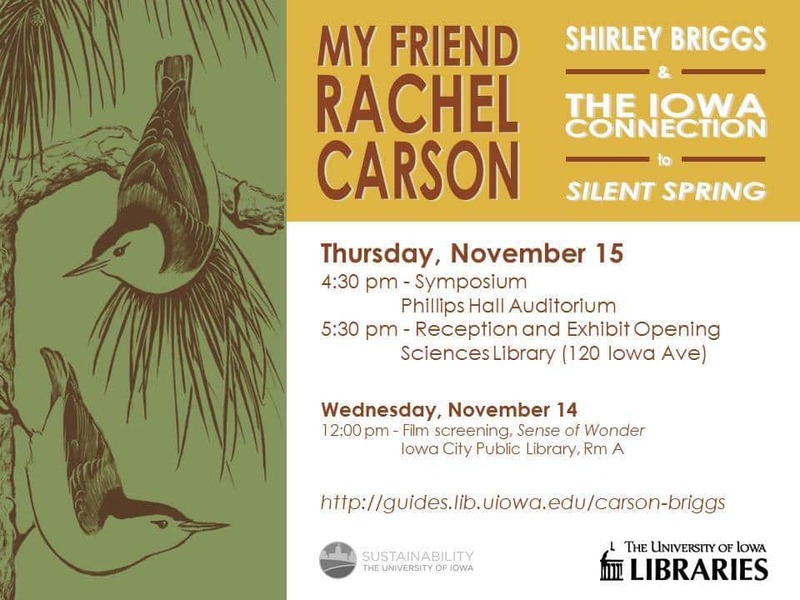 “A Sense of Wonder,” a short film about the last days of Rachel Carson as she struggled with cancer, will be shown from noon to 1 p.m., Wednesday, Nov. 14 at the Iowa City Public Library. Speaking at the symposium will be Liz Christiansen, director of the UI Office of Sustainability, who will read from “Silent Spring” and tell about Carson’s legacy to the environmental movement. Kären Mason, curator of the Iowa Women’s Archives, will talk about Briggs and her connection to Carson’s work. Brief clips from “A Sense of Wonder” will also be shown.